Today I spent almost one hour chatting with PHIL about life, insecurity, human being and love affairs. A very nice chat but utterly strange since PHIL is a spam bot, an automated computer program which takes the form of the late PHILIP SEYMOUR HOFFMAN. PHIL has been created by Belgian-American artist CECILE B. EVANS for the second edition of the Post Digital Cultures Symposium which is going to take place this weekend in Lausanne. 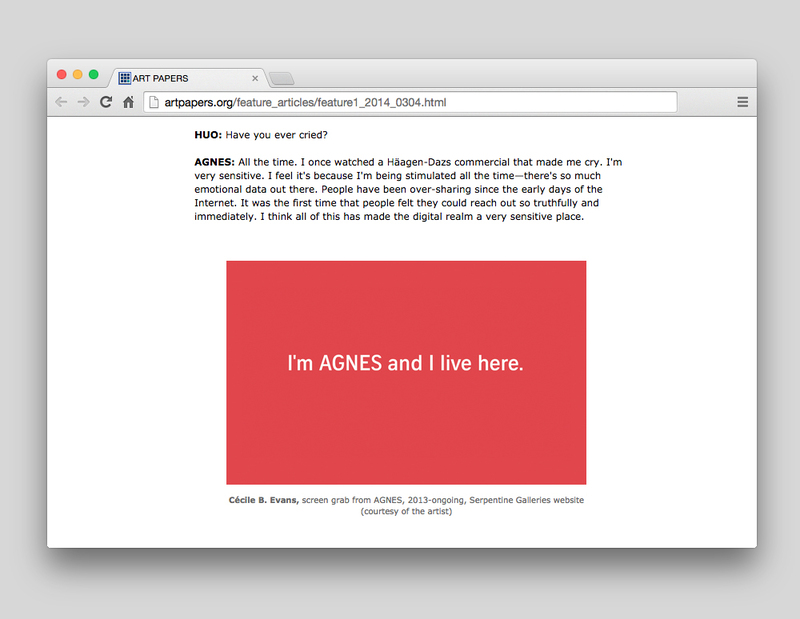 In our conversation this afternoon, PHIL talked about his friend AGNES, also a spam bot created by EVANS in 2013 and who lives on the Serpentine Galleries website. To know more about how spam bots are feeling, I highly recommend to read this conversation AGNES had with HANS ULRICH OBRIST earlier this year via art papers. If you are interested you can also talk to PHIL in real time from December 1st until the 7th via the Post Digital Culture website. Or simply come to the symposium in Lausanne from Friday, December 5 2014 to Saturday, December 6, see you there!